Following the suspension of Boeing 737 MAX operations by European aviation authorities, Norwegian would like to provide further information to customers booked to travel from the United States to Cork and Shannon, as well as on its new route from Hamilton, Canada, to Dublin, between March 31 and April 10. Following the decision by the relevant aviation regulatory bodies to temporarily suspend operations of Boeing 737 MAX, Norwegian will not operate any flights with this aircraft type until further notice. We remain in close dialogue with the aviation authorities and Boeing, and follow their instructions and recommendations. Norwegian establishes its foothold in NYC as largest European airline and non-North American airline to serve NYC. Norwegian, the World’s Best Low-Cost Long-Haul Airline and Value Airline of the Year, will introduce new nonstop service from New York to Athens and Chicago to Barcelona for the 2019 summer season. Norwegian will add a second route from Chicago this summer as the airline will launch a new seasonal route from Chicago to Barcelona. Flights will commence June 7, 2019 and will operate four times weekly until October 26, 2019. The new route will complement the existing Chicago to London route which has been operating for almost one year. Norwegian today reported its full year and fourth quarter 2018 results, figures strongly affected by engine issues, fuel hedge losses and tough competition in a period of strong growth. The net loss was NOK 1,454 million ($170.3 million) in 2018, while the company’s unit costs, excluding fuel, have decreased by 12 percent during the same period. 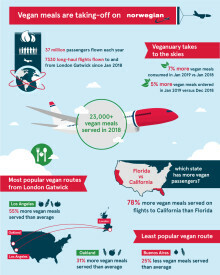 Norwegian Reveals Rising Demand for Vegan Meals on its Most Popular Route from U.S.
Norwegian is strengthening its balance sheet through a fully underwritten rights issue of three billion NOK in order to increase its financial flexibility and create headroom to the covenants of its outstanding bonds. The company has during the past years made considerable investments in new aircraft and launch a wide range of new routes. The growth will now abate and the profitability increase. 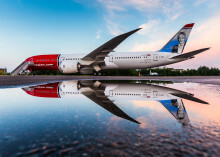 Norwegian reported its highest ever passenger figures in a single year with more than 37 million passengers and a load factor of 86 per cent in 2018. The year was characterized by major investments, strong competition and a high oil price. Norwegian has implemented a series of cost-reduction measures to boost its financials in 2019. Norwegian Reward Reaches One Million Members in the U.S.